CHELMSFORD, Mass. — The Army is looking for a few good robots. Not to fight — not yet, at least — but to help the men and women who do. These robots aren't taking up arms, but the companies making them have waged a different kind of battle. At stake is a contract worth almost half a billion dollars for 3,000 backpack-sized robots that can defuse bombs and scout enemy positions. Competition for the work has spilled over into Congress and federal court. The project and others like it could someday help troops "look around the corner, over the next hillside and let the robot be in harm's way and let the robot get shot," said Paul Scharre, a military technology expert at the Center for a New American Security. Regardless of which companies prevail, the competition foreshadows a future in which robots, which are already familiar military tools, become even more common. The Army's immediate plans alone envision a new fleet of 5,000 ground robots of varying sizes and levels of autonomy. The Marines, Navy and Air Force are making similar investments. "My personal estimate is that robots will play a significant role in combat inside of a decade or a decade and a half," the chief of the Army, Gen. Mark Milley, said in May at a Senate hearing where he appealed for more money to modernize the force. Milley warned that adversaries like China and Russia "are investing heavily and very quickly" in the use of aerial, sea and ground robots. And now, he added, "we are doing the same." Such a shift will be a "huge game-changer for combat," said Scharre, who credits Milley's leadership for the push. Concerns that popular commercial drones made by Chinese company DJI could be vulnerable to spying led the Army to ban their use by soldiers in 2017. And in August, the Pentagon published a report that said China is conducting espionage to acquire foreign military technologies — sometimes by using students or researchers as "procurement agents and intermediaries." At a December defense expo in Egypt, some U.S. firms spotted what they viewed as Chinese knock-offs of their robots. The China fears came to a head in a bitter competition between Israeli firm Roboteam and Massachusetts-based Endeavor Robotics over a series of major contracts to build the Army's next generation of ground robots. Those machines will be designed to be smarter and easier to deploy than the remote-controlled rovers that have helped troops disable bombs for more than 15 years. The biggest contract — worth $429 million — calls for mass producing 25-pound robots that are light, easily maneuverable and can be "carried by infantry for long distances without taxing the soldier," said Bryan McVeigh, project manager for force projection at the Army's research and contracting center in Warren, Michigan. A third $100 million contract — won by Endeavor in late 2017 — is for a midsized reconnaissance and bomb-disabling robot nicknamed the Centaur. The competition escalated into a legal fight when Roboteam accused Endeavor, a spinoff of iRobot, which makes Roomba vacuum cleaners, of dooming its prospects for those contracts by hiring a lobbying firm that spread false information to politicians about the Israeli firm's Chinese investors. A federal judge dismissed Roboteam's lawsuit in April. "They alleged that we had somehow defamed them," said Endeavor CEO Sean Bielat, a former Marine who twice ran for Congress as a Republican. "What we had done was taken publicly available documents and presented them to members of Congress because we think there's a reason to be concerned about Chinese influence on defense technologies." The lobbying firm, Boston-based Sachem Strategies, circulated a memo to members of the House Armed Services Committee. Taking up Endeavor's cause was Rep. Seth Moulton, a Massachusetts Democrat — and, like Bielat, a Marine veteran — who wrote a letter to a top military official in December 2016 urging the Army to "examine the evidence of Chinese influence" before awarding the robot contracts. Roboteam CEO Elad Levy declined to comment on the dispute but said the firm is still "working very closely with U.S. forces," including the Air Force, and other countries. But it's no longer in the running for the lucrative Army opportunities. 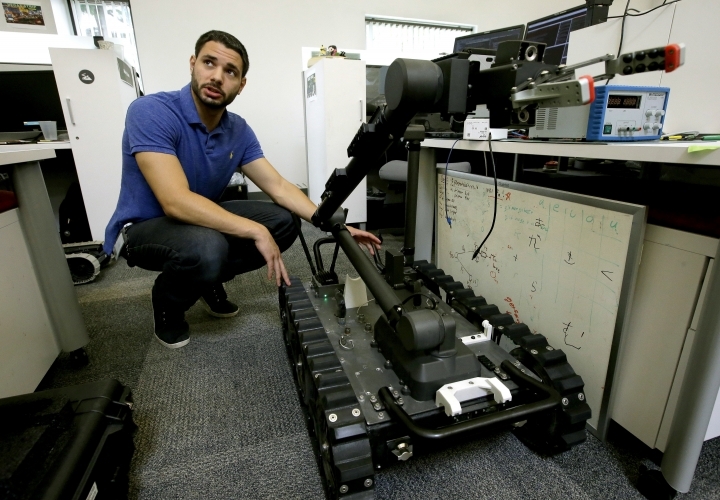 Both Endeavor and Qinetiq have strong track records with the U.S. military, having supplied it with its earlier generation of ground robots such as Endeavor's Packbot and Qinetiq's Talon and Dragon Runner. After hiding the Scorpion behind a shroud at a recent Army conference, Bielat and engineers at Endeavor showed it for the first time publicly to The Associated Press in November. Using a touchscreen controller that taps into the machine's multiple cameras, an engineer navigated it through tunnels, over a playground-like structure and through an icy pool of water, and used its grabber to pick up objects. 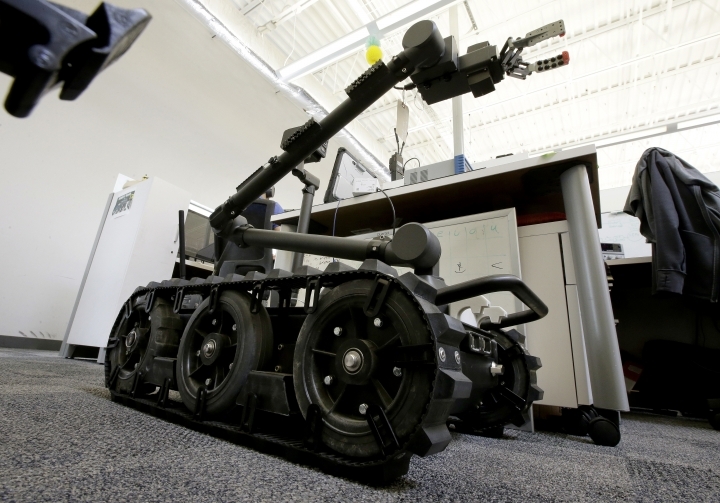 It's a smaller version of its predecessor, the Packbot, which was first used by U.S. troops in Afghanistan in 2002 and later became one of soldiers' essential tools for safely disabling improvised explosives in Iraq. Bielat said the newer Scorpion and Centaur robots are designed to be easier for the average soldier to use quickly without advanced technical training. "Their primary job is to be a rifle squad member," Bielat said. "They don't have time to mess with the robot. They're going to demand greater levels of autonomy." A November report from the Congressional Research Service said that despite the Pentagon's "insistence" that a human must always be in the loop, the military could soon feel compelled to develop fully autonomous systems if rivals do the same. Or, as with drones, humans will still pull the trigger, but a far-away robot will lob the bombs. Said P.W. Singer, a strategist for the New America Foundation think tank: "China has showed off armed ones. Russia has showed them off. It's coming."